Yeah! I dunno if this is the 2019 “Let’s Get It On” but it’s got some of that energy… over a smoother beat though. Tek, Steele, and Rozay doing the WORK on this single!! Duck Down stay doing it don’t they? Get another taste of what’s cooking from Steele & Tek. New music from Smif N Wessun’s ‘The All’ album, out 2/22, produced by 9th Wonder and The Soul Council. Recognize you f**king with some grown a** mans! You knew this joint was raw back when we posted the audio… Now there is a video. Dope! Any thought you had of stepping to Smif N Wessun – because maybe you thought you thought they’d lost a step – “Let It Go” suckas. The Duckdown duo has still got it. And they are putting out music to let y’all know. 9th Wonder on the beat, too. Step off! The beat is by Daringer. Statik Selektah is around on this one, but he’s just holding down the scratches for this ominous jawn featuring Smif-N-Wessun. “Bad Decisions” is out now. With a remix of “Pearl Harbor” off the Wu-Tang project, “The Saga Continues,” we get feature bars from Mathematics, Method Man, Ghostface Killah, Sean Price, Pharoahe Monch, and Tek (of Smif-n-Wessun). Hit after hit coming off his “Lucky 7” project. And another one from Statik Selektah the super-producer. This is “Murder Game” (featuring Young M.A., Smif N Wessun and Buckshot). 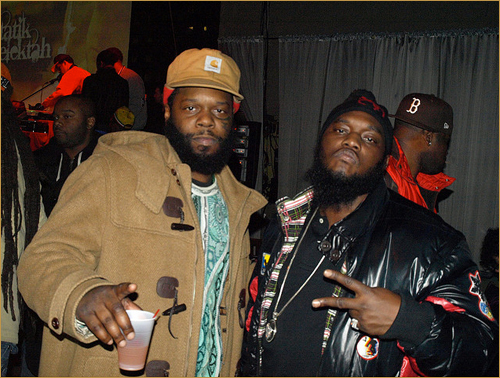 La Guardia Cross captured the knowledge and realness shared by Smif-N-Wessun after their show at The Stage in Miami. Big up to Tek and Steele. Worthwhile viewing. DOPE!! Philly Freeway links with Tek on this jam that finally has some visuals to match the song. Gritty beat, gritty bars, gritty scenes, gritty beards!!! Beard Gang!! Brand new video from the Pete Rock & Smif-N-Wessun collaborative album “Monumental” that’s out now! I’m diggin’ the good visuals the brothas have been dropping as of late to compliment the music on the album…. Proof that great beards stick together! Dope track from Freeway and Tek.